New #Cars 2016 photos and prices. World premiere of a powerful and expensive coupe-crossover BMW X4 M40i 2016-2017 model year took place in the framework of Detroit Auto Show 2016 in Detroit, the US. 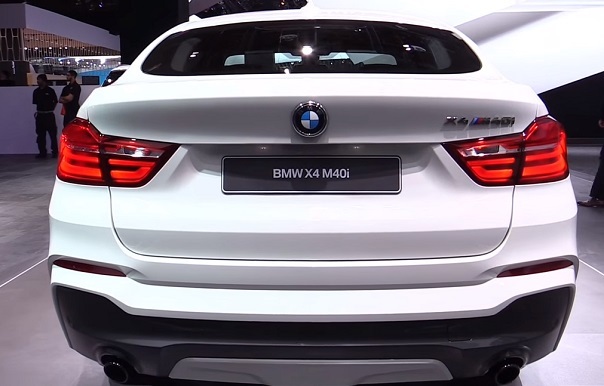 New X4 M40i with the index of the Bavarian company BMW’s 360-horsepower gasoline engine has become the new top model of the entire family of BMW X4, edging out second place 306-hp BMW X4 xDrive35i. 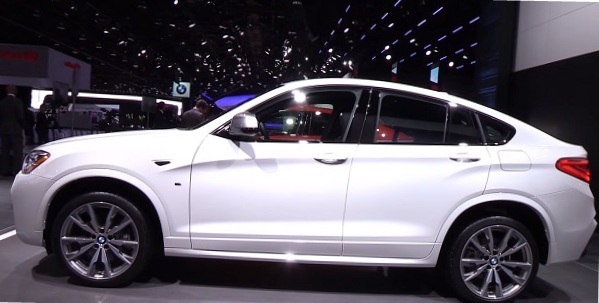 The price of the new compact coupe crossover BMW X4 M40 ah in America starts from 57,800 US dollars, and Germany asked for a new model of 65,000 euros. Will there be a new BMW X4 M40i in Russia, and how much it will cost you a premium crossover in the domestic market is not yet known. We offer our readers specifications, photos, videos and complete the most powerful version of the German coupe-crossover premium in the line of BMW X4. Externally, the top model BMW X4 M40i is different from their counterparts from X4 family more expressive and sophisticated design of the body created by BMW M Performance specialists. The front bumper has got a stylish chrome inserts on the tops of the side air intakes, exterior mirrors got body colored enamel Ferric Grey, feed crossover sports a bumper with divorced from side to side pipes of the exhaust system. Standard equipped with new Michelin Primacy Runflat tires size 245/45 R19 and 19-inch alloy wheels. As an option offered specially made for the model 20-inch wheels made of light alloy with five double spokes and tires Michelin Pilot Super Sport, on the front axle in size 245/40 R20, rear axle — 275/35 R20. 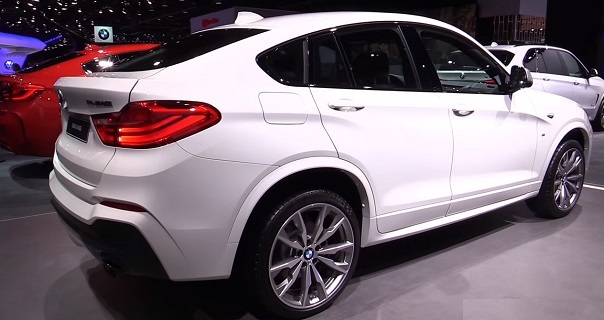 External dimensions of the new body BMW X4 M40i 2016-2017, amount to 4671 mm long, 1881 mm (including exterior mirrors — 2,089 mm) in width, 1624 mm in height, with a 2810 mm wheelbase. The new German coupe-crossover BMW X4 M40 ah — now the embodiment of exclusivity, sportiness and emotional. To paint finishes novelties offered seven options enamel, six of the M Sports Package Package and one new — Long Beach Blue metallic. Interior powerful top version of the BMW X4 Crossover family is exactly the same and copies salons less powerful versions, but some of its salient points, of course, present. Available steering wheel and control handle 8 automatic transmission with logo BMW M Performance as magical for fans of the Bavarian company «M» the letter, the same logo emblazoned on the aluminum dead pedal. Name X4 M40i model applied to the pad, which is located on the doorsteps of the body and on the dashboard. As standard equipment standard equipment of the new coupe-crossover BMW X4 M40i features leather trim (the most chic — white interior with red stitching), perfectly contoured seats for driver and front passenger with electric and heated mirrors, climate control, parking sensors, bi-xenon headlamps , LED foglights and rear position lamps, BMW Professional audio system with a color 6.5-inch screen, on-board computer, and other trifles. Under the hood of new items installed 3.0-liter six-cylinder TwinPower Turbo engine (360 hp 465 Nm), mated to a 8 Steptronic automatic transmission and Launch Control system. Available xDrive all-wheel drive system with an assistant in the person of Performance Control, which allows perfectly to distribute torque between the rear wheels, four-wheel drive, by the way, is set up with an emphasis to the rear wheels, front connected only with the active rear wheelspin. The powerful motor, fast 8-speed transmission, intelligent all-wheel drive and independent suspension with adaptive shock absorbers provide the coupe-crossover phenomenal dynamic and high-speed characteristics. From 0 to 100 mph car accelerates in just 4.9 seconds, top speed of 250 mph (limited electronically), fuel consumption in the combined cycle, according to the manufacturer 8.6 liters per hundred. The main competitor for the new Bavarian crossover BMW X4 M40i also cars from Germany, the new Porsche Macan GTS with 360-horsepower gasoline engine accelerates cars to 100 mph in 5.2 seconds. BMW X4 M40 ah, not only quickly dispersed, but is almost $ 10,000 less, so that the victory will clearly be for the novelty of Bavaria.